Thousands are expected to honor the life and legacy of former President George H.W. Bush at the National Cathedral in Washington, D.C., on Wednesday. President Trump has declared Wednesday a national day of mourning, as the nation remembers its 41st president. Mr. Bush has been lying in state since Monday in the Capitol. Along with the current president and first lady, the Obamas, Carters and foreign dignitaries will be in attendance. The ceremony begins at 11 a.m.
Former President George H.W. Bush, who died late Friday, was transported from Houston to lie in state at the U.S. Capitol Monday evening through Wednesday morning, when the late president will be honored with a state funeral at the National Cathedral in Washington, D.C.
U.S. flags at the White House, on all public buildings and grounds, at all military posts and naval stations, on all naval vessels and at U.S. consulates and embassies abroad are flying at half-staff for 30 days, and President Trump, who will attend the funeral with the first lady, also designated Wednesday a national day of mourning. On Thursday, there will be a memorial for Mr. Bush at St. Martin’s Episcopal Church in Houston — the same church where his wife, Barbara, was memorialized earlier this year. 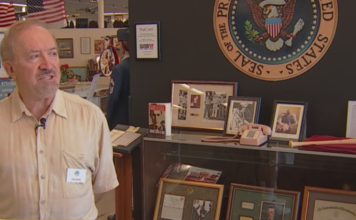 The former president will be buried at his presidential library in College Station, Texas, after a private ceremony later in the afternoon. 12 p.m. – Mr. Bush’s casket departs Ellington Field Joint Reserve Base in Texas and heads to Joint Base Andrews in Maryland, along with the Bush family. 3:37 p.m. Special Air Mission 41, the plane carrying Mr. Bush’s casket, lands at Joint Base Andrews, and is being received by members of the armed services. Mr. Bush’s sons, former President George W. Bush and Neil Bush, former first lady Laura Bush and several grandchildren, as well as Mr. Bush’s close friend and former secretary of state, James Baker III, accompanied him on his final flight on Air Force One. 5 p.m. – Before the late president lies in state at the U.S. Capitol, the Bush family, Justices of the Supreme Court, members of Congress, state governors, diplomats, Navy admirals and former cabinet officials will participate in a short service. Vice President Mike Pence, Senate Majority Leader Mitch McConnell and outgoing House Speaker Paul Ryan are scheduled to make remarks. 7:30 p.m. – Mr. Bush lies in state and public viewing at the Rotunda of the Capitol begins. President Bush lies in state, so that members of the public may pay their respects until Wednesday at 8:45 a.m.
Wednesday, Dec. 5 – State funeral, Washington D.C.
11 a.m. – A state funeral for Mr. Bush is held at the National Cathedral in Washington, D.C. CBS News reports that Mr. Bush’s son and former president, George W. Bush, will deliver a tribute, while former first lady Laura Bush will offer a reading. Former Sen. Alan Simpson, R-Wyoming, Mr. Bush’s biographer and historian John Meacham and former Canadian Prime Minister Brian Mulroney will also make tributes during the ceremony. 12:30 p.m. – After the state funeral concludes, Mr. Bush’s casket will depart for Joint Base Andrews and then return to Texas. 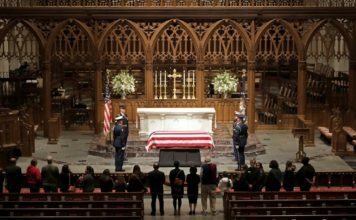 5:45 p.m. – A service is held at St. Martin’s Episcopal Church in Houston before Mr. Bush lies in repose until Thursday at 6 a.m.
6 p.m. – Mr. Bush is buried at his presidential library in College Station, Texas, after a private ceremony.